New ‘Arrested Development’: Actually Happening! Ever since Fox canceled Arrested Development in 2006, rumors—and sometimes promises—of the sitcom’s return have persisted. There was a failed push to transfer the series to Showtime, followed by five years of on-again, off-again, maybe-back-on-again plans for a movie about the Bluth family. By the time Netflix announced a deal last fall to produce a fourth season of the show to debut in early 2013, fans had earned the right to be skeptical, and not even the sight of the reunited cast at April’s National Association of Broadcasters convention in Las Vegas seemed like definitive proof that new episodes are really, really under way. 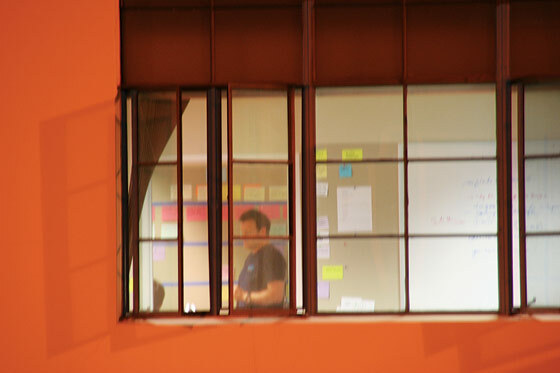 So, how about this: We obtained a photo, taken at 8 p.m. on Tuesday, May 7, above a soundstage on a studio lot in Culver City, of Arrested Development creator Mitch Hurwitz hard at work on the show’s revival. Reached for comment, Hurwitz told us, “I was working in the room with the writing staff. We were discussing the Maeby episode.” You may (finally) commence chicken-dancing.